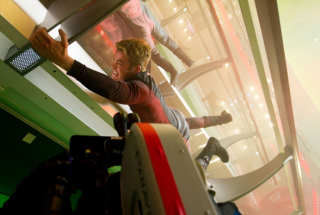 A still publicity image of Captain Kirk played by Chris Pine in the film “Star Trek: Into Darkness." David Brin is an American scientist and award-winning author of science fiction. He has received the Hugo, Locus, Campbell and Nebula awards. Brin is also an advisory board member to the Museum of Science Fiction in Washington, D.C. Greg Viggiano is the executive director for the museum. The authors contributed this article to Space.com's Expert Voices: Op-Ed & Insights. In early 2013, we began planning the first Museum of Science Fiction in Washington, D.C. We envisioned it as a museum that would do justice to the astounding breadth and richness of science fiction history, a place where we would preserve that history for posterity and an education center where visitors could learn about and embrace the ideas of science fiction. The Museum of Science Fiction's first home will be a modular preview museum, which will open in late 2015 in nearby Arlington, Va., and remain in place until the creation of the full-scale museum facility is completed about four years later. The Preview museum will give the public a taste of the full-scale museum's future offerings, allow visitors an opportunity to test exhibits and programs, and collect visitor feedback on the full-scale facility. The museum's permanent collection will feature a selection of objects, including literary and scholarly science fiction works; personal papers from science fiction authors, artists and directors; special effects pieces, models, costumes and props; audiovisual recordings and games; art and photographs; scientific artifacts; convention-exclusive items and ephemera such as scrapbooks and autographs. Despite its focus on the history of science fiction, the Museum of Science Fiction could more accurately be called the Museum of Our Future Lives, as exhibits will integrate characters and themes from science fiction with technology that is, or soon will be, reality. Ray Bradbury's dystopian short story "August 2026: There Will Come Soft Rains" (1950) features an automated house that continues cooking eggs, cleaning itself, watering the lawn and making martinis even after its owners have died. Ads in Steven Spielberg's film "Minority Report" (2002) customize themselves to the registered interests and preferences of passerby. Now such ambient technology is becoming mainstream, as evidenced by Wi-Fi-enabled security systems, NEST thermostats and smartphone keyless entry. The Museum plans to take that technology even further through its own central computer, Ambient Intelligence ("amb-i"). Amb-i will recognize visitors in the museum's gallery spaces via smartphone settings, greet them with personalized holographic figures when they enter the building, create an individualized itinerary based on a visitor's favorite books and movies — even customize exhibits. 'Star Trek' ToS or the J.J. Abrams reboot? When you first visit the museum, a virtual Captain Kirk (from the original or rebooted "Star Trek," your choice) will offer you a personalized welcome before you go over to look under the hood of a prototype trilithium-photon probe from the television show and decide which parts of it most interest you. In keeping with the museum's goal to stimulate STEM (Science, Technology, Engineering and Mathematics) learning, you'll be able to use your smartphone to instruct the probe to explain its propulsion system, stream its stored heliophysical data or map a mission to Alpha Centauri. More of a "Dune" fan than a Trekkie? An exhibit about technology in Frank Herbert's classic novel "Dune" (1956) will feature a professional-grade replica of the "stillsuit" that reclaimed water for wearers on the parched planet of Arrakis — and alongside it, real-world advances in water reclamation and purification. Amb-i will allow visitors to dismantle a virtual stillsuit and compare its parts to its 21st century kin. Another promise of future tech is the concept of architectural sociability, which integrates social communication and technology into a building's design. Its common elements are social networks, localized data streams, ubiquitous computing, pervasive networks and smart environments. The supermassive hole, dubbed "Gargantua," plays a large role in the sci-fi epic "Interstellar." In anticipation of the movie's Blu-ray and DVD release this week, fans can also enjoy an online text-based game, a website about the science of the movie, and a special screening on April 7. Amb-i can notify museum staff of an opportunity to provide an impromptu mini- lecture about an "Interstellar"-related topic, maybe something about time travel and relativity, black holes, or perhaps suspended animation. Amb-i can present information on technologies from the film that are actually in development, such as NASA's TORPOR project related to suspended animation. Amb-i can direct visitors to "Interstellar"-related content around the museum so they can meet visitors with similar interests at a designated place and time. Visitors can communicate with each other via amb-i and form relationships creating new social and learning communities. One of the ironies of the museum's plans is that, in success, it may well become untethered from a specific location. In the world of science fiction, we've seen whole worlds and experiences created in the eye or mind of a participant: no bricks or mortar needed, thank you. The holodeck from "Star Trek: The Next Generation" and Tom Cruise's 3D family photo album in the film "Minority Report" are transportive experiences enjoyed from the comfort of the living room or workplace. Virtual reality technology may provide museum visitors with a more engaging approach to learning about science fiction topics such as anatomy or physiology. Imagine being a student visiting the museum for the first time and sitting down at a research console. You don an Oculus Rift headset and forearm controller that give you access to a vast science fiction catalog containing materials about other worlds, vehicles, exobiology, technology, computers and robots. The exobiology listing catches your attention and you begin scrolling through sub-categories within it: "Literature," "Television," "Film" and "Not Classified." Curious, you tap "Not Classified" and discover an illustrated catalog of life forms you've never seen before. "Species 2112" is midway down the list, and you pause to study the small image of a strange being. It resembles a cross between a Komodo dragon and a gorilla, and a quick double-tap on the image prompts a full-size, three-dimensional representation of "Species 2112" to appear before you. When you get up and begin walking around the being, you realize that it's more than a simple image. The texture of its strangely scaled-yet-furred spine draws you in for a closer look, and you select the "Cutaway" button on your Oculus Rift's forearm controller. As you watch, the creature disassembles itself before your eyes, revealing muscle systems, neural networks and organs. When you tire of running simulations of the being's digestive system, you press "Cutaway" again and its body parts reassemble themselves, leaving the "Species 2112" specimen standing before you. The "Activate" button on your controller triggers a demonstration of the creature's walking, running and resting motions and their associated sounds. You decide that you've seen enough for now, but you definitely want to remember this strange being for your future research. You press the "Print" button on your controller, take off your Oculus Rift, and stop by the museum's Makerbot to pick up your small 3D model of "Species 2112" before you leave. While this example of how the museum will employ augmented reality technology focuses on exobiology, its associated learning objectives could also provide students with a more interesting and engaging means of learning high school anatomy. The Museum of Science Fiction must also address the question of how to serve both virtual and in situ participants in a created environment, and its answer is the Exorarium Project. The Exorarium Project inspires visitors to expand their horizons both outward, to far-away galaxies, and inward, to the very molecules that constitute life. This evocative teaching concept will employ Oculus Rift technology to allow physical and virtual museum visitors to interact with one another as if they were present in the same physical space. The Exorarium Project will invite physical and online museum visitors to enter a unique learning environment that combines state-of-the-art simulation and visualization systems with the best ideas from astronomy, physics, chemistry and ecology. In this virtual sandbox, museum visitors will work together to create and explore vividly plausible extraterrestrial environments and test them in realistic first-contact scenarios. With amb-i and the Exorarium Project to augment and enhance the Museum of Science Fiction's physical buildings, it will truly be the Museum of Our Future Lives. Einstein said it best, "Imagination is everything. It's the preview of life's coming attractions." At the Museum of Science Fiction, we could not agree more, and we're excited to bring the history of our favorite genre — and the technology of your future — to you. Learn more in the press packet for the Museum of Science Fiction.